Your company can sponsor any of our events listed on the events page. If your company would like to sponsor other specific events please contact us. You can sponsor one of our already planned events listed on the Events page or can request to sponsor specifically for a particular avenue like Technical, Professional Development, Outreach, Educational, etc. If you are unclear about the specific event your company would like to sponsor, SWE-ECI can work with you to find an event that is aligned with your company's outreach goals. 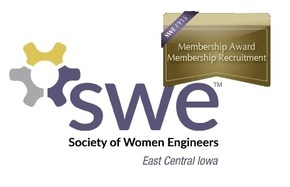 You can then contact us by sending an email to swe-eci@swe.org. Your company can get increased visibility in the local community through SWE-ECIs advertisements through various avenues like our website, mailing lists, radio and newspapers. Your company will also be featured in an article in our newsletter outlining your support of SWE. SWE-ECI and the local community will be grateful to your contribution and your support of the local engineering community and your incentive to promote engineering through our various programs.